Naughts & Cross stitches: Let the fun begin! So university is finished for the Semester, it's 3 months ish until I go back next year. Work is still crazy busy but it is contained to just days. My evenings are mine again! I have so many awesome plans for this time. Particularly since I spent this last Sunday cleaning my craft room. Oh my it looks stunning! I focused not just on cleaning but on finding homes for everything that was on the floor not just moving it to another area. That is what took so long as I have sorted through a lot of stuff to get it to what I want. I didn't actually take any good before and after photos (bad blogger) but did manage to take two videos which you'll find over on my instagram here. I would embed it here but that has never worked in the past so I'm going to assume it won't now. 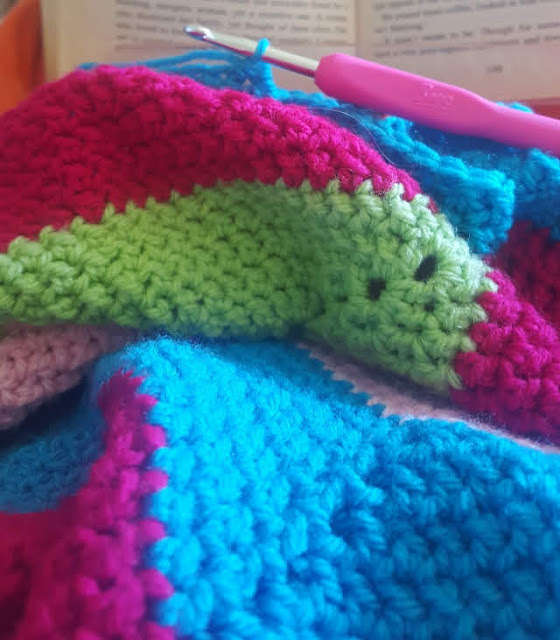 I have been working on my rainbow ripple star blanket and it's getting bigger and bigger. I'm not sure exactly where to go with this blanket, not sure how much bigger I'm actually going to push it. When I finish the 6 rows of the blue am I going to call it? Or should I add even one row of each of the colours as a kind of border? Should I add a different border in the blue as the last row of the 6? So many questions going round my head. I will see if I can get a photo of this whole blanket later to show you how big it is now it's big enough to curl up under on the couch but do I want more? Also got some more fabric this is particularly picked up with a pattern in mind. I NEED some shorts for this coming summer. It's already hot so I need to try something. I'm looking at the itch to stitch Belize shorts as they are elastic waisted and don't have a fly, but also don't look like extreme gathering as the front is flat and the elastic is only at the back. You can find the pattern here. I will probably add length to the legs but I will be making a muslin before playing with my fun fabrics here. 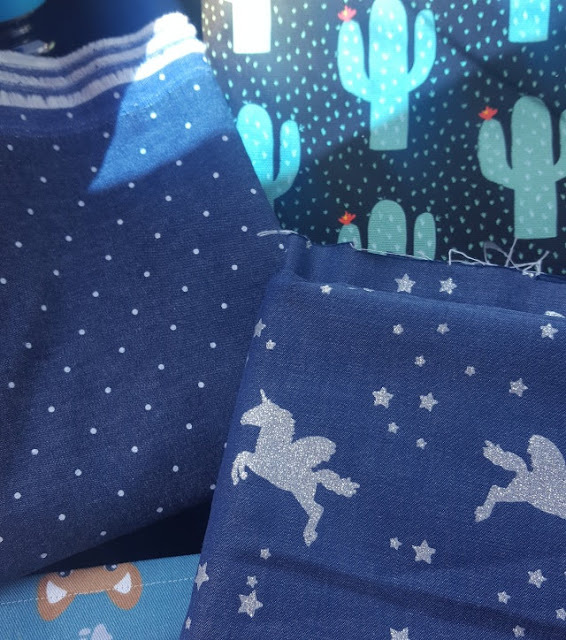 The two dark blue ones are tencel denim and the cactus one is a Duck Cotton. I have enough for 3 pairs of shorts Maybe a 4th if I place things right for Lana if she wants a pair. Also that dog fabric is actually a sewing finish but I forgot to get photos of me wearing it so a finished post will probably be coming next weekend. It should be washed by then and able to be worn. Lastly I have been cross stitching!!!! I'm so close to a finish on this Doctor Who biscornu! I am getting really excited about this! Who is watching the new doctor at the moment? I'm loving her and I love how it's panning out. Expect to see more cross stitch again as I have more time to craft I'm going to get back into it as I really enjoy just stitching. It makes me happy so I need to do it. 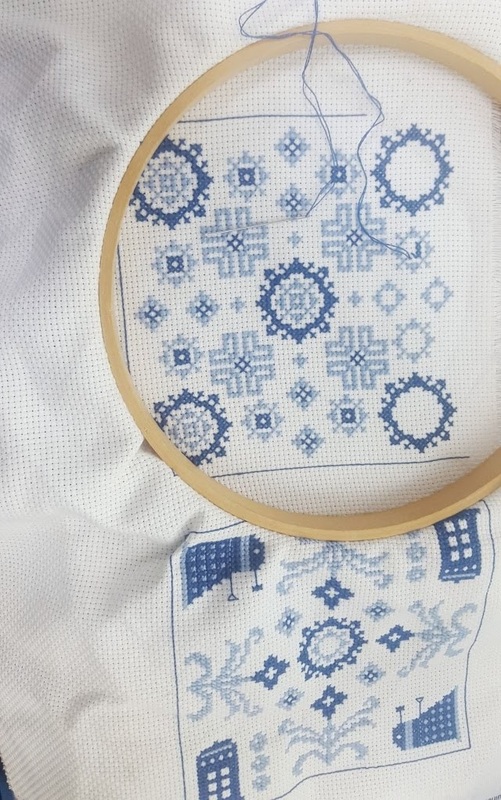 I'm hoping for a finish on this one by the end of the week as I'm making sure I get off my computer at work and do something at Lunch that isn't staring at a screen so Cross Stitch really works. Anyway that's it for my update, and expect to see me more around here as I get back into crafting over the holidays.